Perfect is an overused word, yet “highly suitable for someone or something” is an accurate description of the 2007 Explorer Sport Trac. It does everything it should—and more—with style, grace and a heaping dollop of panache. For 2007, Explorer Sport Track is all-new, and radically revised. The 2007 Explorer Sport Trac offers a V8 for the first time—the 3-valve 292 horsepower 4.6-liter V8 found in other Ford trucks. Paired with a class-exclusive 6-speed automatic transmission with a wide 6.04:1 gear span (this means the engine is more often in the “sweet spot” for fuel economy, emissions reduction, and power) it can tow 6,800 pounds and has 1,390 pounds of cargo capacity. The other available engine, an upgraded 4.0-liter V6, meets Tier 2 Bin 4 emissions regulations and produces 210 horsepower (5100 rpm) and 254 pound-feet of torque (3700 rpm.) More important this week is the fact that the V8 and a reasonably light foot on the accelerator can deliver 20-plus miles per gallon. In fact I regularly exceeded 20 mpg on the freeway and nearly 15 mpg in 60/40% highway/city driving. Explorer Sport Trac is neither an F-150 or Explorer, nor is it a cut-and-paste hybrid of the two. From nose to the B-pillar it is an Explorer. From there back it is unique with its own doors, suspension, frame, and pickup bed. 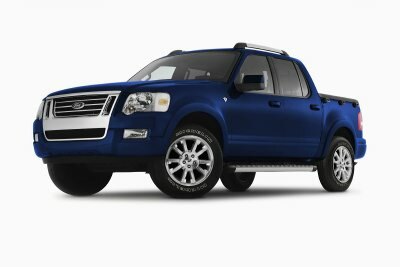 \ Unlike an F-150, Sport Trac has Independent Rear Suspension. IRS not only provides a great ride, it changes packaging to allow more cargo volume. Though the bed is less than five feet long (4’6”,) Sport Trac can carry the necessary 4x8 plywood. In my case it carried eight 4x6 mirrors plus some plywood. I used the molded-in pockets and built twin crossbars. This presents two problems. There is no support aft of the crossbars – I made one with a sturdy box connected to the tailgate. And while Ford offers the terrific bed extender that flips out to hold anything that will fit into the bed-plus-tailgate area, it is taller than the stake pockets. One other little problem, the tailgate latch bolts are less than 48” apart. So I put the plywood sheet between mirrors number five and six so the remainder wouldn’t contact the latch bolts and shatter. Styling is what sells vehicles. Women described the Sport Trac as having “lots of style, a great package, comfortable to drive, and very quiet.” They also called it “cute” which makes menfolk cringe. We’d call it rugged or handsome. The point being, it’s a vehicle the family will enjoy without gender bias. Inside you’ll find sport bucket seats in front, folding 60/40 rear bench, and Tuflor ™ rubber flooring. It cleaned easily when I spilled my water bottle. And I really loved the new audio system with Sirius radio. Quiet Ride: The most often commented on aspect of the 2007 Explorer Sport Trac is its quietness. It is, indeed, “Lexus quiet.” Four can converse in normal tones while listening to the radio and cruising at 75 mph. There is little outside noise transmitted and tire noise from off road tires is minimal. It truly is quieter than most sedans. IRS: The 2007 Sport Track feels nimble, athletic. Suspension is not overdamped, nor overly stiff, the vehicle feels much smaller and more nimble than size would indicate. While the stock Sport Trac is not an off road specialist, it handled very steep hillsides of loose rock and gravel with ease. Part of this competence is the traction control system that limits wheel slip and thus works similar to a locking differential. Fun to drive: Good steering feel Steering is taught, accurate, “just right” in firmness and heft. It’s a fun vehicle to drive on the highway or on twisting roads like the notorious Ortega highway near San Diego. That’s due to a frame that is over 400% stiffer than predecessors. Safe: Safety is another Ford goal and Sport Trac has all of the safety features of Explorer, including roll stability control. Notably, the IIHS has delivered a “Good” frontal-offset crash rating. It meets every safety standard through 2010. Good Mileage: Gas mileage is a touchy subject and as individual as the weight of your right foot. Using cruise control I got 23-25 mpg at 55 mph on secondary roads; 20-23 mpg at 70-75 mph on highways, and an overall mixed 14.6 mpg driving 78-80 on highways mixed with city. A truck that can get 25 mpg is a very welcome thing, and the tonneau cover was not always in place to boost fuel economy. Good Navigation System: I got lost not using the navigation system out in California. Once turned on, it helped find my destination. Ford’s system is intuitive to use and does two interesting things, displaying the current road name as well as announcing “turn right on Wilson-Palomar road in 50 feet.” Not just “turn right in 50 feet.” This is helpful when multiple roads intersect. Conclusion: If I were buying a new pickup and not “in the trades” needing a heavy duty pickup, this would be on my short list of vehicles. It is stylish, well designed, rugged, retains its resale value, and really does haul everything you might need in modern urban or suburban living.